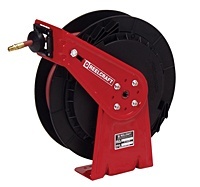 Hose Reel features 50' of 3/8" I.D. 300-PSI hose in a professional grade design. Made in the USA. Latch mechanism and shielded stainless steel spring ensure long life and easy retraction every time. Lightweight composite reel reduces overall weight for easier mounting. Hose handles air or water, carries 300 psi and withstands 150�F.Adjustable guide arm allows floor or wall mounting at 7 different angles. Reel weighs 29 lbs. Hose measures 50'L with an inside diameter of 3/8".